A transport chair is specifically designed to be pushed by a caretaker, or a person other than the wheelchair user. Transport or travel chairs are the type most commonly found in healthcare facilities such as retirement homes. A caregiver can propel the elderly user in the chair, which makes their daily living much easier. It is usually a light wheelchair that easily folds to fit in your car trunk and is not as bulky as a standard wheelchair. The most obvious components of a transport chair are the four small wheels that are standard with all transport chairs. Sometimes the rear wheels are a little larger, but not on the scale of a manual wheelchair. Usually a manual wheelchair will have 2 small wheels in the front to allow a good turning radius, and large wheels on the back to allow the user to propel on their own. With transport wheelchairs, large rear wheels are not necessary because at all times the chair will be pushed by an individual other than the person in the chair. Transport chairs also tend to be a whole lot lighter than their manual counterpart. This is because it is made to be compact and does not need all the extra “fluff” accessories that tend to weigh down manual chairs. They are also usually a lot narrower in width than most manual chairs. This is to allow the user to fit through narrow hallways or doorways when traveling indoors. The Karman S-115 Ergo Transport Wheelchair features an ergonomic “S” shaped seat that provides the perfect shape to fit the human body to relieve pressure, increase stabilization, weight distribution and lower the risk of pressure sores and scoliosis. Since this is supposed to be an easily transportable item, weight is important, especially if you are going to more than one location throughout the day. The lower cost more basic transport chairs are typically made of steel, so will be heavier. Aluminum transport chairs are lighter and cost more but are more popular. Rule of thumb, as the chair weight goes down the cost typically increases. Comfort is a key criterion, so choosing the proper size chair is important. The most common seat width is 19”, but they are also available for smaller people at 17” or larger people up to 22”. It’s best to consult with a therapist, health professional or provider when making this choice. As well, the majority of transport chairs come with foot rests that are adjustable in length, swing out of the way and are removable for convenience when storing or putting in the car. It’s a good idea to make sure that is the case with the chair you’re considering. The brakes are used to lock the chair in place when stationary, and are an important safety item when getting in and out of the chair. They are usually located on the rear wheels. Not all braking systems are equal. Typically the lower cost transport chairs have a more basic breaking system. In many cases this is sufficient; however, if this is a concern you should take a look at the higher end transport chairs, as you will find that the mechanism is better quality and they brake better. As well, some transport chairs come with hand brakes, this can be convenient if you’re dealing with hilly surfaces or a heavier person. The better quality chairs usually have larger and softer wheels providing a better ride. Some of the better transport chairs have ergonomically designed handles. Again for some this may be helpful while for others unimportant due to infrequent use. Some transport chairs come with flip back and removable arms. The arm rest can flip all the way back if needed. This is important for those who have limited mobility and require lateral transfers from their chairs, cars or any other area. The Drive Medical Deluxe Fly-Weight Aluminum Transport Chair pictured above is lighter than the traditional transport chairs. This chair features a deluxe back release that folds down the back and the lightweight aluminum frame makes this chair easy and convenient to store and transport. 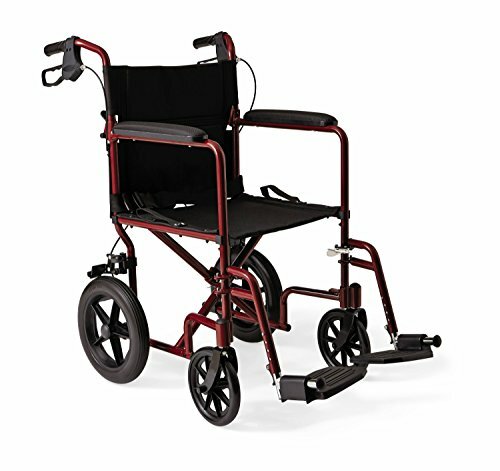 The Drive Medical Deluxe also features composite, 8″ caster wheels in front and rear with rear wheel locks to offer a smooth ride over most surfaces. It includes a soft, plush upholstery, a seat belt for additional safety and a carry pocket on backrest for easy and convenient transportation of personal items. There are some excellent consumer reviews for this chair. The Transport Chair/Rollator is simply a Rollator medical walker that converts and allows someone to sit facing forward on the seat with a back support and foot rests. This can provide a convenient two in one option. The Graham Field Lumex Hybrid LX Rollator Transport Chair above combines the function of a transport chair and a wheeled walker into one lightweight design. This HybridLX features a comfortable and wide seat and backrest, secure handgrips and can be converted from a rollator to a transport chair effortlessly. My mother had this Lumex hybrid rollator, which she mostly used for walking when she was in the hospital and hospice, and recently, my father found it useful as he recovered from a hernia operation. This has been a very useful piece of mobility equipment in our family, and we have found the quality to be excellent. Note that rollator/transport chair combos are not particularly comfortable for long periods of sitting, but their versatility can be very convenient. For periods of longer sitting, my mother used a transport chair (see below for my recommendation). See also Choosing a Medical Walker. While everyone has different priorities, I believe that the one chair with the most features for the best value is the TranSport Aluminum Transport Chair by Drive. According to medical supply store owners that I have spoken to, this chair offers the highest level of comfort and specialization available in a lightweight transport chair. The TranSport chair was designed and built with comfort as a top priority. The foldable seat is stronger and better supported than the seats of most other transport chairs. It is rigid rather than loose, and both the seat and back have a layer of relaxing padding to ease long periods of use. This chair is also fully customizable to fit your preferences. The footrests are easy to adjust, requiring no tools, and they are even completely removable. The padded armrests flip up to provide a wider area of use if preferred, and they are also easy to remove. The Drive TranSport is also extremely well-engineered. It folds down to only 8.2″, small enough to fit in the trunk of even a compact car. Magnets built into the frame keep it securely closed, so it is easy to deal with and easy to store. At 14.4 pounds, this transport chair is one of the lightest on the market! The compact frame and light build don’t impact its stability, though- the TranSport chair still has the 250 pound weight capacity of most other standard transport wheelchairs. For comfort, convenience, and strength, the Drive TranSport is definitely the best transport wheelchair that I have come across. This chair has many features not found in any other model, and is still a lightweight, easy-to-use chair that is comfortable for both the user and the caregiver. 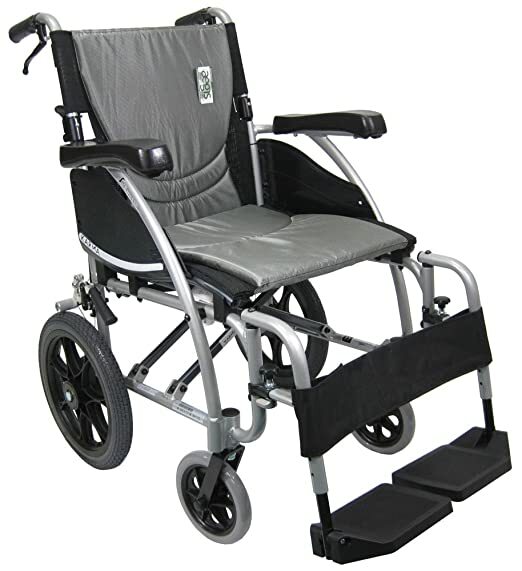 If you are looking for a high-quality transport wheelchair, this one is worth your attention. Choosing a transport chair is a big decision, and you want to be certain you will enjoy all the benefits of a chair without any problems. Be sure to look for a lightweight chair with large wheels, comfortable design, and a width that will let you use it without problems. I hope this article provided you some practical information on transport chairs.